^ Izadi, Elahe. "The moment on election night when Stephen Colbert couldn't make a joke". The Washington Post. The Washington Post. Retrieved January 1, 2019. ^ Itzkoff, Dave (November 9, 2016). "For Stephen Colbert, a Very Uncomfortable Election Night". The New York Times. ISSN 0362-4331. Retrieved January 1, 2019. ^ VanDerWerff, Todd (November 9, 2016). 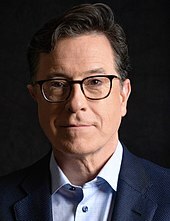 "Stephen Colbert couldn't hold it together on live TV". Vox. Retrieved January 1, 2019. ^ The Guardian staff (May 23, 2017). "FCC will let him be: no action against Stephen Colbert after Trump joke". The Guardian. Guardian Media Group. Archived from the original on May 23, 2017. Retrieved May 23, 2017. ^ Gillette, Sam. "Stephen Colbert Trolls Trump with Kids' Book Using President's Comments During Hurricane Florence". PEOPLE.com. Retrieved February 1, 2019.